A great piece in the Holderness Gazette says it all. Thanks very much to Ray and Kathy. The next walks will be on Sunday 21st February. Hope to see you there. Greville Road was named after a Hedon MP ,,1584 to 1586, Sir Fulke Greville. Born 1554 and died 1628 he came from a rich Warwickshire family. Greville found his way in to the court of Queen Elizabeth I and was soon one of her favourites. So much so that she restricted him from travelling aboard with Francis Drake and on other escapades. He Became Secretary to the Navy, Commissioner to the Treasury and then Chancellor of the Exchequer, Privy Councillor and Gentleman of the bed chamber. He was MP for Southampton for one term before getting the seat in Hedon by a recommendation from his fellow MP and Cousin Henry Constable of Burton Constable Hall. He was given Warwick Castle by James 1, who he also served. It was then in a very run down state but he spent time and money rebuilding it and is today a gem. After the one term in Hedon he went on to MP for Warwickshire. He was also known for his writings and poetry. He also wrote letters and dramas. His most famous work was his biography of his very good friend Sir Philip Sidney. Hedon station looking towards Hull from the crossing. 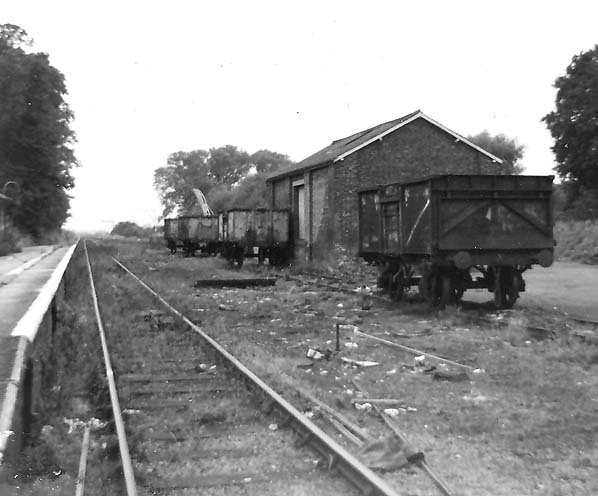 There was a track that went the far side of the shed and boarded the parish of Preston. Looking through my photos I found this picture of Magdalen Gate from October 1983 It was just before the old assembly rooms were pulled down to make way for the car park outside the Church Rooms. My Mum, Betty Porter, told me that during WWII it used to be one of many venues where dances were held around the area. I think you must have been able to go to a dance any day of the week as there were so many. I think Mum, from what she said must have visited most of them too. Apparently it was 1/6d with tea and biscuits included. The cloakroom was downstairs and you went up a rickety old staircase to get to the dance floor above. The band were usually an Army quartet or quintet. At the end it was used as the venue for a boxing gym for a boys club. Bethell Court is not named after an asylum but after another of the town’s MP’s. Well in fact two of them. Sir Hugh Bethell was born at Rise in 1615. His father was also Hugh and his mother was Ellen Johnson from Bishop Burton. He married Mary Mitchellbourne from Carleton in 1641. He was a brave and clever soldier and fought for the Parliamentary Army (Oliver Crowell) and commanded a regiment at the Battle of Marston Moor where he lost and eye. He was Governor of Scarborough Castle for a year and was made a Justice of the Peace and Sheriff of Yorkshire too. He sat in two or the parliaments held during the protectorate. He was knighted by Richard Cromwell in 1658. Following the death of Oliver Cromwell and the failure of Robert Cromwell to maintain the Protectorate in 1659 Hugh took part in the uprising in Yorkshire to ensure that Parliament remained free. They succeeded and in 1660 Hugh Bethell was elected as an MP for Beverley and Hedon. He wisely chose Hedon! He was elected four times and died 1679. In his will he left 50/- to start a charity for the poor of Hedon. As both his son and grand son had died before him his tile etc went to his nephew, also Hugh. His parents were John Bethall of Skirlaugh and Mark Hildyard of Ottringham. Hugh had been born in 1648. It seems that he had been Mayor of Hedon 1683/4 and then was elected as the Town’s MP in 1695 at a by election. It doesn’t seem as though he was a very enthusiastic MP and when in 1700 he managed to obtain long term leases on the family land he did not stand at that years election. Henry Guy is said to also have opposed him standing. He died in 1717 and the estate went to his son, also Hugh. He did leave a bequest to many villages in the area for the poor and it seems likely that Hedon received £12. It doesn’t look like we are to be favoured with the best weather for the walks on Sunday. Please remember though that if you come the walks will take place. The morning walk starts at 1030 from the car park on Market Hill and is the Town Tramp. The afternoon walk starts from Johnson’s Corner car park (Corner of Fletcher Gate and Thorn Road) and takes in the Haven Hike. The afternoon walk can be muddy in places so make sure that you are prepared. Hopefully I will see some of you there. Once every four years we have this date so I thought I would mark the occasion with another post. You maybe aware that the Duncombe’s are from the estate at Helmsley but their rise to power was swift. Sir Charles Duncombe was in 1648 and was apprenticed to a Goldsmith in London, and then later became a member of the Goldsmiths’ Company. He started trading as a banker under the banner of a grasshopper that was later Martin’s Bank that is now part of Barclay’s Bank. His wealth bought him friends and he was soon established in the Government as the Receiver of Customs, a post he held under Charles II and James II. He was elected to Parliament after being voted in for Hedon. The other MP was Henry Guy, the giver of Hedon’s Town Hall and large mace. However he lost his seat in 1687. All this time Duncombe had been securing his place with regular loans to the administration. In 1688 James II fled the country as popular feeling ousted him for trying to restore the catholic faith to the country. William and Mary were brought in to rule. Duncombe refused to lend James £1500 to aid his escape to France but quickly loaned £20000 to the new administration so securing his positions. In 1694 he bought the Helmsley Estate that was to become Duncombe Park and is still owned by the family. He bought it off the Duke of Buckingham at a time when he was bitterly opposed to the Bank of England. He may have been putting his money in to solid land rather than see the markets fail under the new Bank. He had been elected for Yarmouth on the Isle of Wight in 1690 but wasn’t overly active in the House contenting himself in assisting with his money. He moved to the seat of Downton in 1695. However in 1697 he refused to lend £50000 and this sparked a very bad time for him. He had plenty of friends in high places, but had also made many enemies and they pursued his with an accusation of corruption in Exchequer Bills. It became very political as his friends and opposition fought to sway the arguments. It then became a battle between the Hose of Lords and Commons. In the end as many other influential would also be implicated his side won the day and having being locked up in the Tower of London for a few months. He was later to also escape two court cases on technicalities. He even won his old seat at Downton in 1702 which he held until his death. He was the Sheriff of London 1699 to 1700 and Lord Mayor of the City of London 1708/09. His brother Anthony became the MP for Hedon between 1698 and 1702. Charles died in 1711 with no will and having not married. His brother Anthony his died before him so the estate, said to be £400000 was split mainly between two nephews. He was said to be the richest commoner in England at the time of his death. It sounds a similar story to that of Sir Hugh Bethell told previously. It is good to know that it doesn’t work like that these days! The time has whizzed by once again and it is this Sunday, 20th March, that my walks are taking place. The weather looks to be dry so a good way of getting a bit of fresh air in your lungs as well as learning a little more about our fantastic town. For more details see the walks listed in the home page menu. Do you know where this is? I expect many pass it every day and never give it a second thought. Learn more on my afternoon walk. Well we have now had the hour added to the clock so days will appear lighter now and so I am hoping more folk will be keen to try one of my walks. The next ones will be on Sunday 17th April. Meanwhile here is another history lesson for you. Villiers Court is named after Thomas Hyde Villiers. Thomas Hyde Villiers seems to have been know as Hyde. He was the second son of the Honorable George Villiers who was the Paymaster of Marines and a favourite of King George III. It was later found that Hon. Villiers was so incompetent that after a few years he was around £200,000 out in hos figures. he resigned but as a favourite of the King he suffered no further penalty. His mother was somewhat bossy and decided that her son Hyde was too delicate to go to so had tutors at home. However he did go to St. John’s College Cambridge. He gained his BA in 1822 and MA in 1825. He got a job in the Colonial Office as a Junior Clerk at £150 a year. He was promoted to Senior Clark and the dizzy sum of £600 per year. He got to meet several influential people from politics and the arts. He suffered ill health and resigned from the Colonial Office in 1825. However he must of used his position to give him some financial security as he became an agent for the Newfoundland and Berbice Companies. Berbice had been a Dutch colony on the Berbice river in what is now Guyana. It was ceded to the UK in 1815 and was merged with other possessions to become British Guyana in 1831. These gave him a salary of about £300 per year each. He was said to be very tall and and had chiseled good looks which seemed to help him get on with most people he came across. Thomas Hyde Villiers MP 24 January 1801 – 3 December 1832. After leaving the Colonial Office he stood for parliament in Hedon in 1826. He had Tory leanings and was voted in as second on the ballot. His brother Charles failed to win a seat in Hull at the same time and he was campaigning against Catholic rights. Hyde later became a great advocate of the emancipation of the Catholics and visited Ireland. In 1830 he gave up his seat in Hedon to sit for that of Wotton Basset as this had family connections. He was elected but at the next election his uncle withdrew his patronage as Hyde had voted for the Reform Act. He stood again but lost out. He did become the MP for Bletchingley near the South Downs. The reform Act was passed in 1832 and this was the end of many constituencies like Hedon and Bletchingley and in the election that followed Hyde Villiers was seeking a seat down in Cornwall. He was looking to win in Penryn. He had been unwell and actually died in Cornwall from an abscess in the head. He was unmarried and intestate and had only £800 worth to his name on his death. With his connections he may well have gone far had he lived to a greater age that 1831, and he was one of those MP’s that finished the line of MP’s for Hedon by voting the Great Reform Act in in 1832. Burstwick Drain put the nail in the coffin for Hedon Haven when it was dug in 1803 to assist with the drainage of the Hedon and Keyingham valleys. Hedon was built due to the waterway that became known as the Hedon Haven with access to the Humber. The Burstwick Drain cut off all of the water that flowed into the Haven so allowing it to silt up completely. There is an Environment Agency monitoring station at Thorn Road Bridge and another south of Westlands. At Thorn you can see that the gauge goes up to 2mts. The max recorded was 1.99mts. There were floods in Hedon in 2007. It looks like there is a new measuring devize hanging from the bridge that can be seen to the right of the gauge of the measure and from the middle of the bridge in the top picture. The lower picture is of the Sheriff Highway bridge over the Burstwick Drain and a little more picturesque. Click on ‘Hedon Thorn Road Bridge’ where you will find lots of information such as the current level, high and low points, any flood warnings and lots of historical graphs. Here’s hoping for some dry weather for the next walk that is on Sunday 17th April 1030 and 1400. Looking forward to seeing you there. It is just a week to go until the next walks. Don’t forget that they happen every 3rd Sunday of every month. It is just come along at the stated time, no booking required. This month the 1030 walk is the Town Tramp which meets up at Market Hill car park and the walks cover the town area of Hedon. The 1400 walk starts at Johnson’s Corner car park and takes in the Haven area of Town. For more details of the walks see the sections on the home page. The weather is looking okay at the moment so hope to see you there. Sunday’s forecast is to be sunny but cold in the morning so why not come and join us on the Town Tramp starting at Market Hill car park at 1030. Just turn up as no booking is required. two hours of exercise for the brain and body in the sun will give you a great appetite for a brunch at one of Hedon’s cafes or pubs. Cost is £4 each. If getting up early is not your Sunday routine how about the Haven Hike that starts from Johnson’s Corner car park at 1400. The weather will be overcast but dry and warmer than the morning. If you have been visiting the CAMRA Beer Festival held in Holy Trinity Church in Hull this will be the one for you. Lay in and then blow the cobwebs away before the hair of the dog at one of Hedon’s pubs selling real ale. Just £4 when you turn up. No booking needed. Twyers Lane is just a bit of a track now but was along the northern boundary of the town at one time. The Reedmere stream runs to it’s north so the road/path formed a type of bank. The Twyers were a well known family in the area. It seems that they were originally servants to the Earls of Albermale at Skipsea Castle, Odo and then Stephen. They gained land from them in the area. The next Earl of Albemarle was William le Gros who was the actual founder of Hedon. William also founded St. Sepluchre’s Leper Hospital that was just north of the Town, where Rosedale clinic is now. It maybe that the Twyers family were named after a small hill to the west of Hedon. The land was bought by Charles Whitiker and a houise and farm were built there. In 1926 the farm was shut down due to an outbreak of foot and mouth disease. The land was bought by Hull City Council, along with the racecourse area as the site of a municipal airdrome. It was in use until WWII. The land also supported J.W. Robson and Sons that had a large brick and tile works and a pottery. This too didn’t last long after WWII. See the Hedon Blog for more details and pictures on this subject. I hope that you have all survived the chill weather. I’m hoping that for my next walk the weather is getting on the more summery side. It will be Sunday 15th May so mark it in your diaries. What a shame that the next walks around Hedon aren’t this Sunday! The weather is set to be fantastic. Maybe folk would be more interested in ice creams on the beaches or barbeques in the garden. The forecast for a week tomorrow are for dry weather though so hopefully I will see you there and if you don’t know where the above door is in Hedon I can point it out to you. Enjoy the sunshine. The next Hedon History Walk is on Sunday 15th May and the Haven Hike starts at 1030 from Johnson’s Corner and the Town Tramp sets off at 1400 from the Market Hill car park. Remember it is £4 for each work and just turn up, no booking required. Hopefully those of you living in the Holderness area will by now have received your free copy of ‘Holderness Heartbeat’, the free magazine. Hopefully when you have been flipping through it you will have seen History Walks advert and also a nice editorial from Ed. (Thanks Ed). The land east of Thorn road was left undeveloped for a long time as it was low laying and so quite marshy. Between the wars it was owned by William Bond who also owned the Old Hall at the corner of Fletcher Gate and Thorn Road. Small little buildings were put up and old railway carriages and other types of shelter appeared too. Little small holdings were set up with the odd chickens and goat etc. One name for the area was Nanny Goat Island, another Bond’s Estate. The new Bond Street is after that William Bond and nothing to do with Sir Thomas Bond of 1720’s that had the ‘other’ Bond Street built on the fields around Clarendon House in the West End of London. It has been the premier shopping area since the 18th century. The south part of Biond Street is Old Bond Street and the north, New Bond Street. If any of you know it Tiffany’s the jewelers marks the join. I think that would be a nice touch to have a new and old Bond Street in Hedon too. Don’t forget it is only a couple of weeks until my next walks on 19th June. The morning walk will start at Market Hill at 1030 and the afternoon one at 1400 from Johnson’s Corner car park. Hope to see you there. In the 2011 census there were 7100 residing in Hedon. Now I reckon we could say that half of them will be female so that leaves 3550. I think that we could say that half of them are under 18 and over 85. That leaves 1775. 75 of those will be working on Sunday, leaving 1700. These days I expect that half of those will be out shopping. (The largest participation sport these days). That leaves 850 chaps. Of those I expect half will not be Hedon, maybe visiting their Dad’s. That leaves 425. Then there will be the ‘inactive’ ones who are still in bed or ill. Half would leave 212! Then there will be the few that have not heard about the Hedon History Walks or seen the Hedon Blog or the Holderness Heartbeat. That will leave 106 fellers. Out of those 106 I reckon half will that great thing, Dad’s!! What better Father’s Day present could you give than a walk round Hedon. You could get him breakfast in bed for the early walk around the town starting at 1030 from Market Hill and follow it with a meal, or just a pint, at one of the many pubs or cafes in the Town. Or, you could let him have a lay in and cook him a nice meal for lunch and then join the walk around the Haven area, starting from Johnson’s Corner car park at 1400. After all that exercise there would be the chance of a pint or a coffee afterwards. My logic predicts that there will be 53 people on my walks this Sunday. Make sure that you are one of them. Looking forward to seeing you next Sunday. Wednesday 15th June 2016 I think Irad Maw was the town lamplighter around the 1900’s. He combined his duties of going round the lamps in the town with a long pole to poke up the base of the lamp, turn on the little gas lamp and then light it with the little oil lamp on the end of the pole. He combined this work with that of running a fruit shop in the Market Place. Find out more about the Hedon Gas Light and Coke Co on my Town walk this Sunday. It is Father’s Day and the weather is set to be fair for a good walk. The Town walk starts at 1030 from Market Hill car park and the Haven walk starts at 1400 from Johnson’s Corner car park. Both are £4. Hope to see you there. Wow, where did June go, 3rd July all ready. This is one of the streets forming the one way system in Hedon. It was also on the banks of the original port of Hedon. The name Baxter comes from the Middle English Bakster and was the Anglo Saxon word for a female baker. The male form was baker and that has become the name for both sexes now. The word gate comes from the Old Norse gata, meaning street, that was brought over with the Vikings. Baxters or bakers were important people in Medieval times and they would belong to a Guild that would regulate the quality etc of the bread. They had to balance the use of their ovens as they would have to make the bread for sale, for their family and to leave time for the community to use it too. Often they rented time in the oven to the Lord of The Manor who would have obligations to provide bread. Yeast was not often used for bread at the time so bread was unleven and flat. The bread was used as a ‘plate’ to hold the meat or fish. The juices etc would soak through and make it softer and more palatable. When leaven bread did become more popular the peasants it was made of rye or barley flour. As this was dark in colour and so hid all sorts of ‘filler’ such as mud and tree bark! The rich therefore demanded white bread so that they could see that it was uncontaminated. A loaf was normally the size that a normal man with a good appetite could eat. In posh houses the head of the house would be given the bread and he would cut off the crusts to give them to the women folk!! Try that in our house and I would be strung up straight away. More facts and stories about Hedon can be heard by joining me on one of my History Walks round the Town. The next ones take place on 17th July. Distaff Lane runs between the Post Office and HSBC Bank and leads to the Church Yard Gates. There is a little plaque on the gates saying they were built by Hedon Blacksmith Mendham’s. A great name for a blacksmith. This short lane used to be called ‘Church Rent’ meaning a gap leading to the church. At one time there were no houses between the Market place and the church yard so the Market Place was that much larger. Distaff may give a clue to one of the trades taking places in Hedon in the past. A distaff is used in spinning flax or wool. It is the ‘stick’ on which the unspun fibre is wrapped round before being drawn out and spun on to a spindle or a spinning wheel. To learn more about the trades carried out in Hedon and the building around the Market Place come along next Sunday 17th July at 1400 starting from Market Hill. To hear about the workings of Hedon Haven and why it was built and how it worked and when it was lost come along for the earlier walk starting at 1030 from Johnson’s Corner car park. See you there. I have just had my copy of the advertising booklet ‘Holderness Heartbeat’ through the door. Somehow it seems that the advert has got mixed up somewhere down the line. Just to confirm that the next walks will be on Sunday 21st August with the 1030 being the Haven Walk starting at 1030 from Johnson’s Corner car park and the 1400 walk around the Town area from Market Hill. Please check the schedule of walks section for dates further in the future. I apologise for any confusion I have caused. Whilst looking round St. Augustine’s church yard I came across the headstone above. George Handley was born in 1837 and died in 1905, aged 68. He had a business which I think was near Haven Basin Road on land that later became the Locarno fishing ponds and now where it fronts Thorn Road has new house on. In the archive is a rental agreement between Hedon Corporation and George Handley where he rented a close (field) of One acre, 30 roods and 30 perches A rood is a quarter of an acre and a perch is 1 /160th of an acre). There was another little parcel of land of 26 perches too. When he was 36 he used the land for a brick and tile works. The rent was £12. The cost went up for every extra 1000 tiles or bricks that he produced. By 1888, when the new Race course on the ‘aerodrome’ opened, the works were doing very well and were producing over half a million drain pipes and bricks a year. The January of George’s death saw terrifying gales on the east Coast of England. Great Yarmouth was flooded and Scarborough pier was washed away too. Ainslie Road is named after the Vicar of Hedon, Rev. Edward Herbert Montague Ainslie. He had been born in Rangoon as his dad was a Captain in the 60th Rifles. He went to Selwyn College, Cambridge, and once ordained was a curate in Middlesborough until 1893 and then in Elston with Normanby before arriving in Hedon in 1903 following the ill health of the then incumbent. He was said to be a short stocky figure that seemed to run the Church on very Low Church principles. He stayed in Hedon for 39 years when he moved due to ill health in 1942. He died in 1954. St Augustine’s Church was built over several hundred years but, although I’m no expert, this door is probably original from the start of it. The rounded arch at the top shows that it isn’t as old as a pointed arch as that is harder to construct. The stone columns on either side of the door are called detached shafts and the ‘blocks’ they are standing on are called water holding bases. The carvings at the top of the shafts, or capitals, have heads and crocketed foliage adorning them. Above are strongly-keeled and deeply moulded round arches. In this photo you can see that there has been some repair work carried out to the stonework. The work is ongoing and is a never ending job as the stone suffers with our modern atmosphere and neglect. The church are doing their best and demonstrating that new uses can be found for these monuments to our past by hosting part of the HedFest 2016 next week and more in the future. There were at least three churches in Hedon in the past. We now have the magnificent St Augustines Church. but previously St Nicholas Church was in the area bounded by St. Anthony’s Park and St. Nicholas Gate. It would have been a timber and wattle and daub building with a thatched roof with maybe stone rubble floor or footings. There is documentary evidence of 100 timber boards being brought up the Haven and then carried to the church in the late 1300. The last evidence of the church is found in 1472. By this time the fortunes of Hedon had waned considerably with the loss of status of the Haven and the local economy could not sustain more than one church. When Henry VIII dissolved the churches during the Reformation by 1537 there is no mention of St. Nicholas Church. It was named for St. Nicholas who was the Bishop of Myra in Turkey in AD 325. He was called to a conference by Pope Constantine to help lay down the principles of the church. He is best known as Father Christmas as he was known for giving surprise gifts. The more likely reason that the church was named for him was the proximity of the port of Hedon on the Haven and the needs of the seamen there. St. Nicholas is also the Patron Saint of seafarers. The next walks around Hedon will be a week on Sunday. That is Sunday 18th September. The morning walk is the Town Tramp starting at 1030 from Market Hill Car Park. The afternoon walk is the Haven Hike and starts at Johnson’s Corner Car Park at 1400. Each walk lasts about 2hrs 15 mins. and costs £4 each. The early forecast is good, and remember that each walk will burn about 200 calories. That is the same as a pint of beer! If you prefer vanilla slices you would have to do both walks and have a little bit of change to allow you to have a Polo Mint or two whilst you walk!